JNN 07 May 2015 Sanaa : Yemeni tribal forces have gained control of about 17 Saudi military posts Till today in retaliation for the Saudi army’s blind artillery pounding of their regions. At the same time The Popular Yemeni Forces have also Shot down an Apache Helicopter used by Saudi Led Aggressive Forces. 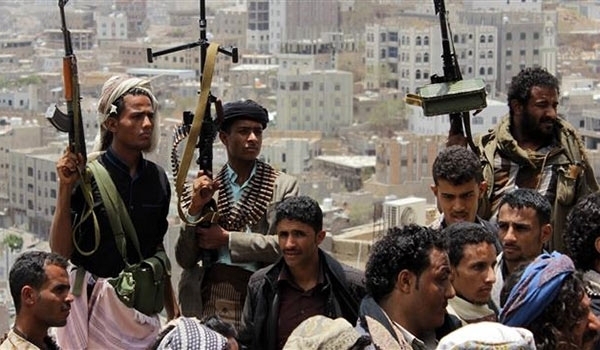 Reports said the Yemeni tribal forces have gained control of 4 military posts in the Saudi border area of Jazan on Thursday. Several Saudi soldiers were also killed in the raid. On Wednesday, the tribal forces captured 8 military posts in the Saudi border area of Najran. 5 Saudi soldiers were killed and 11 others injured in tribal forces’ mortar attack on Najran. Earlier reports said the Yemeni tribal fighters had won control over 5 military posts in Jazan and Najran. Cross-border skirmishes between the Saudi troops and Yemeni tribes have flared up over the last four weeks, as the monarchy’s airstrikes continue and have so far claimed the lives of thousands of innocent people, particularly at border areas. Yemen’s popular forces shot down a US Apache attack helicopter used by the Saudi-led coalition in the province of Sa’ada on Thursday. Reports said the popular forces and the army shot down the chopper in Al-Baqa district in Sa’ada. Riyadh launched its airstrikes against Yemen on March 26 without a UN’s mandate. Saudi Arabia aims to undermine the Ansarullah popular fighters and restore power to fugitive President Mansour Hadi, who is a staunch ally of Riyadh. On April 21, Riyadh announced the end of its military operations, but airstrikes have continued with Saudi bombers targeting different areas across the country in a new phase. The monarchy’s aerial bombardments have so far claimed the lives of at least 3,572 people, mostly women and children. Meanwhile, civilian casualties were reported as the Saudi warplanes continued to conduct intensive air strikes on Sa’ada on Thursday. On Wednesday, Saudi-led coalition air strikes claimed the lives of 400 civilians in the Yemeni province of Sa’ada in less than 24 hours. Saudi Arabia has been striking Yemen for 43 days now to restore power to fugitive president Mansour Hadi, a close ally of Riyadh. The Saudi-led aggression has so far killed at least 3,572 Yemenis, including hundreds of women and children. This entry was posted in Middle East and tagged Border Posts, Chopper, Saudi border forces, Yemeni Forces. Bookmark the permalink.